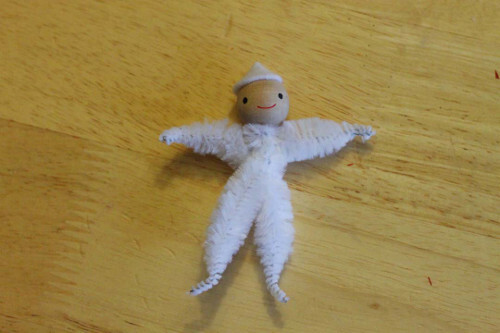 Bring a little Christmas cheer to your tree by making these adorable little elves. 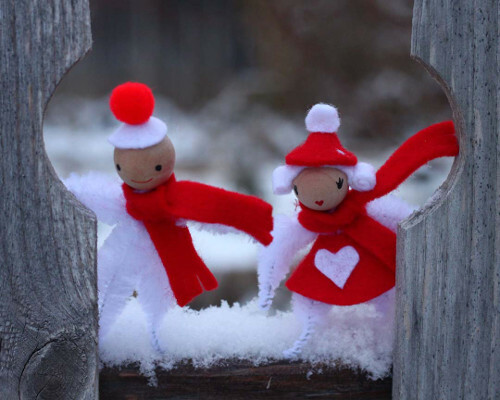 These simple elves are fun to embellish, and are the perfect craft to create with your kids. Red and black acrylic craft paint. 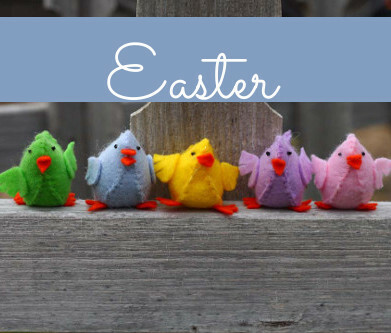 To begin, cut one of your bump chenille stems in half, so each half has 2 bumps. 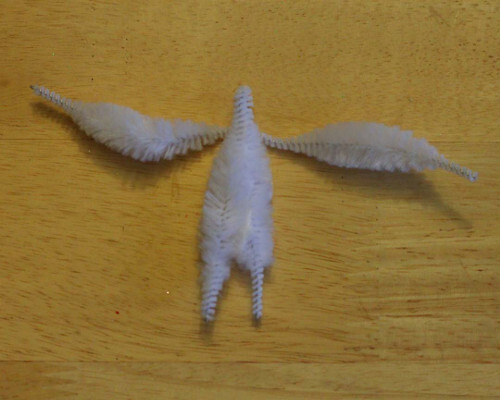 Fold one of the halves in half to form the legs, and place the other unfolded half stem behind to form the arms, as shown in the above photo. Twist the unfolded arm stem around the top of the folded leg stem, leaving about 1/4″ of the top of the leg stem exposed (This will be where you glue the head) until the arms and legs are about the same length. Give the legs one small twist, to help form the body. 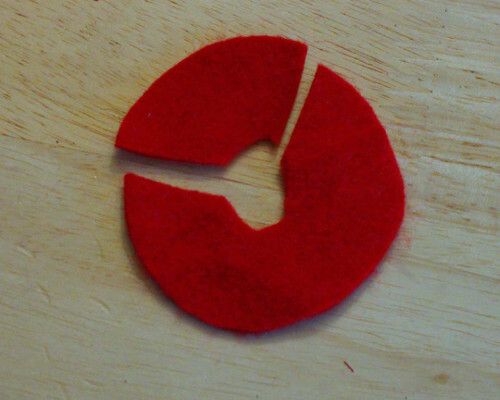 Cut a quarter-sized circle of felt, and cut 1/4 wedge out of it. 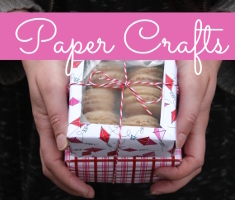 Fold one of the straight edges over the other, and glue, to form a cone shaped hat. Glue the hat on the elf’s head, and using your black and red acrylic paint, paint eyes and a mouth on your elf’s face. 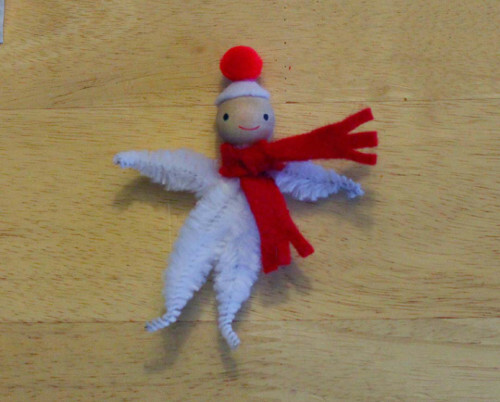 Cut a strip of felt 4″ long by 3/8″ wide, to be a scarf for your elf. Cut fringe on the ends, if desired, like the photo. 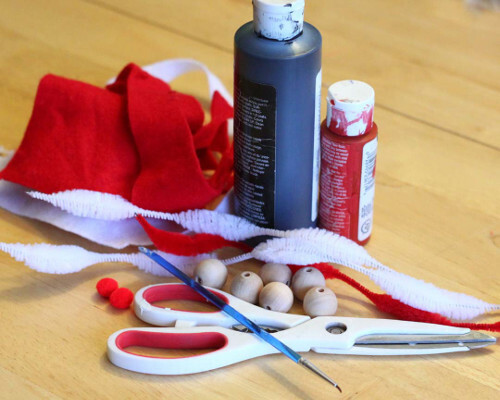 Knot the scarf around your elf’s neck, and glue a pom-pom on the top of his hat. 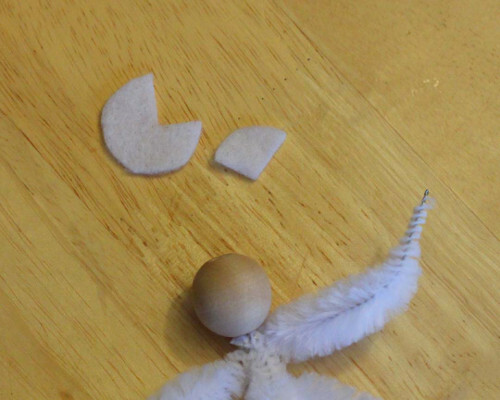 To make a girl elf with a skirt, cut a 2 1/2″ circle from your felt, cut away 1/4 of the circle in a pie shape, and then cut a 3/8″ hole in the very middle to be the waist of the skirt. Wrap the skirt around your elf’s waist, and glue the straight edges together, overlapping slightly. 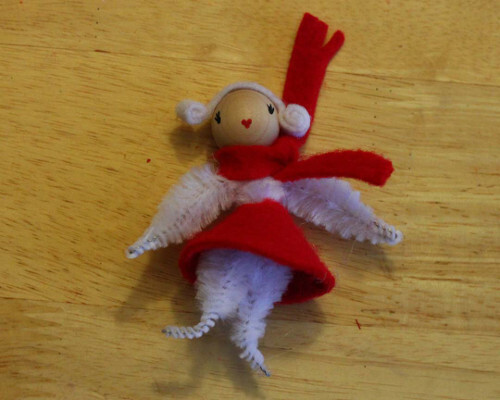 To make hair on your girl elf, cut a small strip of felt 1/4″ wide by 2″ long. 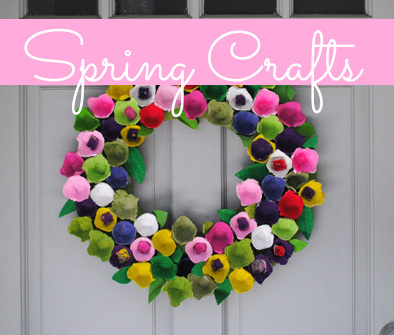 Roll both ends up toward the middle, gluing as you go to secure each tiny roll, leaving the middle inch of the felt strip un-rolled. 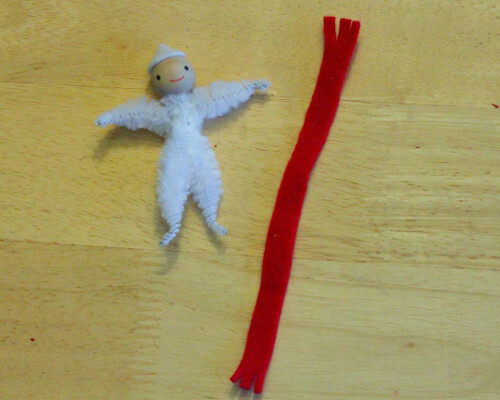 Glue the un-rolled middle portion of the felt strip to the top of the elf girl’s head. Then glue a hat on top of the hair, if desired. 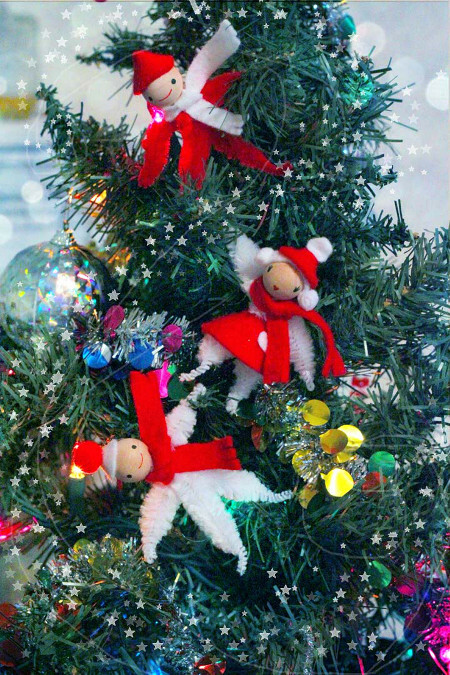 Make an army of elves for your tree, to tie onto packages, decorate wreaths, or just to spread Christmas cheer around your home . 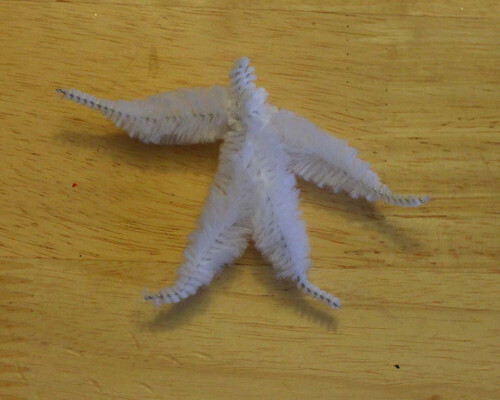 This entry was posted in Christmas, Crafts, Family Crafts, Holidays & Seasons, Kid's Crafts and tagged chenille Stems, Family Crafts on December 9, 2014 by Michelle.